This red monorail travels the length of the Delta terminal on an interior, elevated track. It is amazing to me that two years ago wifi was banned on Tsinghua campus-- and everywhere else-- but now it's everywhere-- or nearly so. At the Shanghai airport anyone can connect. The password is your cell phone number. Since I had not yet bought my phone, I couldn't. Donna, a volunteer student from the conference sponsor Hainan University College of Tourism, attached herself to me and took me shopping for a new mobile phone, shouji, a Samsung 3G with internet and video camera which I am trying to learn how to use. One thing I needed to do was book my next flight from Sanyo, Hainan to Guangzhou, my next destination. In the middle of negotiating with the travel agent in the lobby with the help of several student volunteers who were paging through the flights on their phones, suddenly all black. Their internet went dead-- not that I even understood at the moment they were on mobile internet in the lobbly where there was not supposed to be wifi. This hotel is owned by the PLA (Peoples Liberation Army). The top two floors, 5th and 6th, are reserved for government and military officers and are the only floors with internet. Yet I am sharing a room on the sixth floor with a roommate Lanping LI from Shanghai, an Associate Professor from Shanghai Maritime University, recently returned from New Zealand where she has been for three years. I requested an ethernet cable from the front desk, and they promised to deliver it to me by 8:30pm, several hours away. Why so long? Weishenme? Promptly at 8:30 a techie arrived to install and confirm my performance. For a few hours I was able to see my gmail and answer messages. But then, again, dead connection, but only for gmail. This has continued until the end of the conference. After reflection, I guess they had to get permission from the military for us civilian interlopers on the 6th floor. And why the gmail should be denied is another story upon which it is not wise for me to comment. 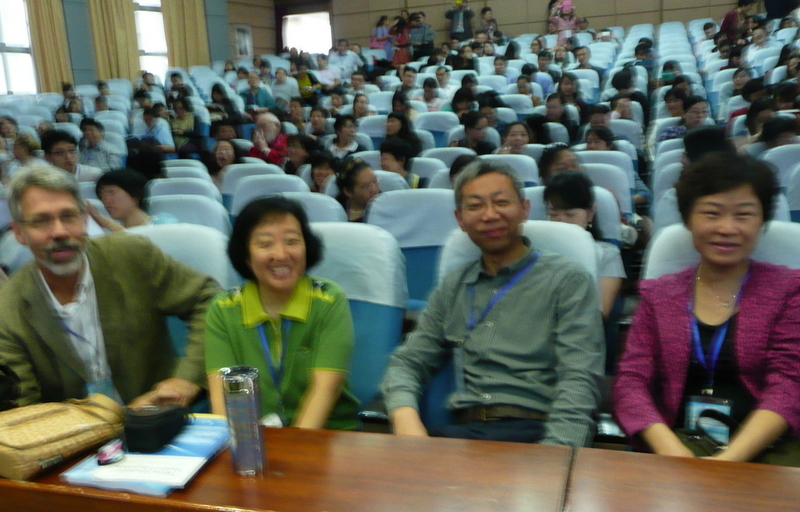 It is only guesswork and speculation, but it felt very familiar, like the old days at Tsinghua in 2011. Adjacent to the hotel is the military HQ for Hainan, sharing a courtyard with the hotel but not accessible to civilians. In the morning I looked out the window to see colorful flags and soldiers in light green shirts and dark pants marching to musical accompaniment from loudspeakers. Towering above the HQ is a massive SIGINT array of microwave equipment. internationally recognized authority on communication and culture, has written many books and is the president of the World Communication Association. Her speech was inspiring as well as entertaining on the main topic of empathy in a world of discord. Here are some quick notes: "Every day of our lives we have a conversation with our ancestors." "We can think things into existence." Everyone is busy cleaning house; a woman is polishing the walls inside the elevator to mirror-like perfection. Why? Weishenme? Because an important person must be arriving. All day I am looking for the motorcade but not see. Instead, while riding up to the room an impressive man with an air of authority gets on with Lanping and me: buzz cut hair and bland Han features on his tan face, dressed in black tee-shirt and pants. We gaze evenly, maybe curiously, at each other as the elevator climbs. I ask, "Can you speak English." He shakes his head 'no.' Lanping asks him for me if he is a high official. His modest reply was that he is only a resident of the hotel as we all exit the elevator together. I had my first anmo treatment, Chinese massage, when student guide Allegro guided me late one evening after dinner. Side by side in a private room with large flat-screen TV running a kung fu movie. The actor's looks reminded me of the famous Chinese artist Al Weiwei. We get a 90-minute massage for 90Y or $14.67. This includes foot, leg, arms, back and neck. They served us delicious barley tea, damai cha, from Korea. The anmoshi are two young woman dressed in green pajamas. Afterwards we are too dreamy to walk back to the hotel so catch a taxi. I am so excited before my presentation, I cannot eat. Just delicious hot, sweet coffee with milk, kaffei hui nai he tang, in plastic pitchers, poured into small handleless cups. I was so gratified there were many people attending my section, about thirty, held in a classroom on the university campus. More intimate from the day before where the welcoming speeches and forum presentations were conducted in a large auditorium able to accommodate the more than 400 attendees. 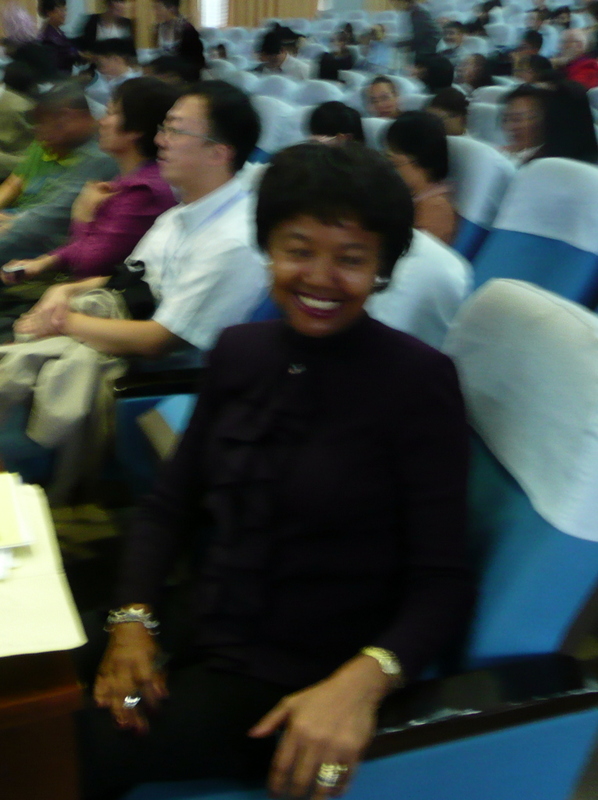 By the way, if you are wondering how Chery managed to get invited to this fabulous 10th CAFIC (China Association for Intercultural Communication) conference, a friend from my prior Beijing experience in 2011 who is a respected academician invited me. If you want to see more about CAFIC and my presentation click here. My PowerPoint was the most colorful and dynamic-- of course :), and afterward many came to ask for my contact info and share their stories. What stories, you might ask? Once the ice was broken by my frank and informative talk about information architecture, user interface and the state of English version websites at Chinese universities, they shared their frustration with the impoverished English sites where no one goes because the information is dated and the experience is useless. They had no idea how to go about fixing it at their own universities. They acknowledge Tsinghua's foresight in hiring me in the first place to assist with their digital and print image issues, as well as other methods of managing their image globally. 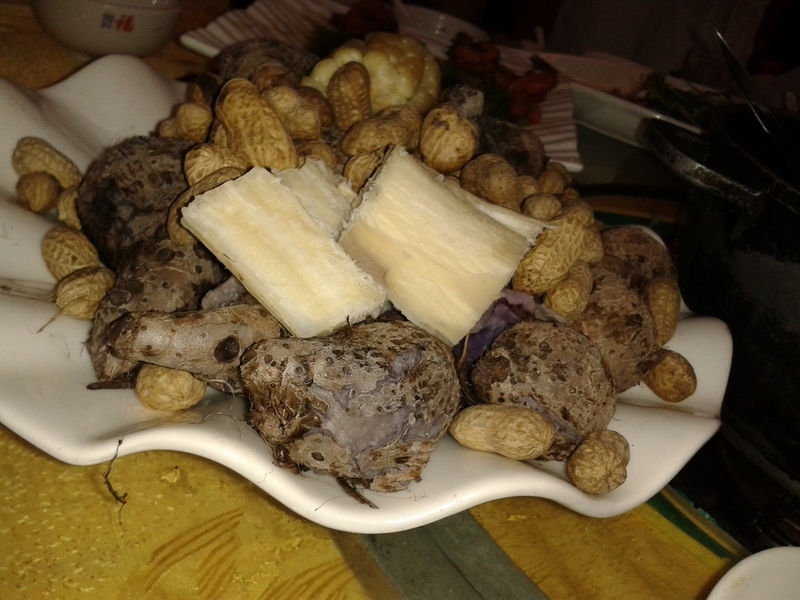 sala salad of lettuce and fruits, many meat dishes on which I will not elaborate, and the most unusual a platter of steamed mountain yam shan yao, Yunnan yam (taro) yu tou, corn yu mi, and sprinkled with peanuts roasted in the shell huasheng.